Alumni, it's time to reconnect! Join us for the first alumni planned and lead event: OneWorld Now! 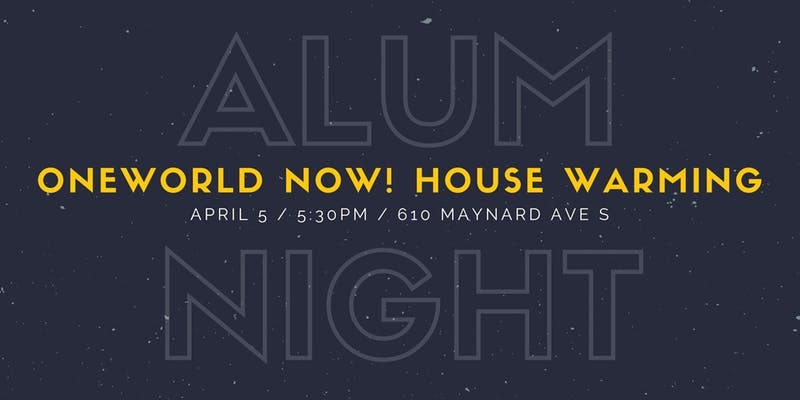 AlumNight, a house warming party, and reunion on Friday, April 5th at 5:30 pm. Look forward to a night full of fun activities, games, and food planned and coordinated by OWN alumni. Visit the new OWN office at 610 Maynard Ave South in the International District, reconnect with old friends and former OWN staff members, meet current students, and learn more about OWN’s new and exciting programs. The event is free with a suggested donation of $10. Proceeds from the event will benefit current students in our Global Leadership Program and contribute towards their study abroad scholarships. Looking forward to seeing you all on April 5th! We have an evening of fun and games planned, including BINGO with a sweet line-up of prizes. We’re giving away 25,000 airline miles on Alaska Airlines, who flies to over 115 locations worldwide. You can also win gift cards to some great businesses.